Course 11: "BBQ pork with the fixin's"
The identity of the "charcoal briquettes" was revealed. 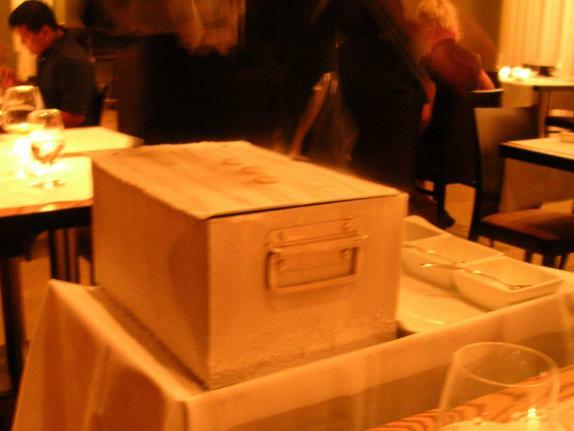 They were rough-cut pieces of high-gluten Pullman bread, dipped in squid ink, toasted in olive oil, then frozen in liquid nitrogen. 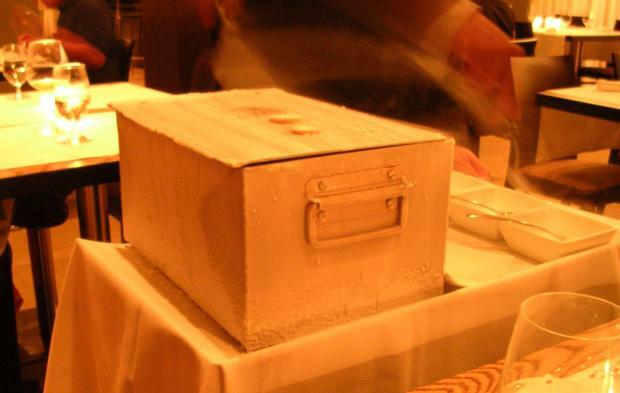 The waiter took two "briquettes" and added them to each person's plate, which had a piece of very tender pork, Kansas City-style barbecue sauce, and Pullman bread purée. This was another marvel. The pork was fall-off-the-bone tender, but didn't seem to actually have been barbecued. (Maybe cooked sous vide?) 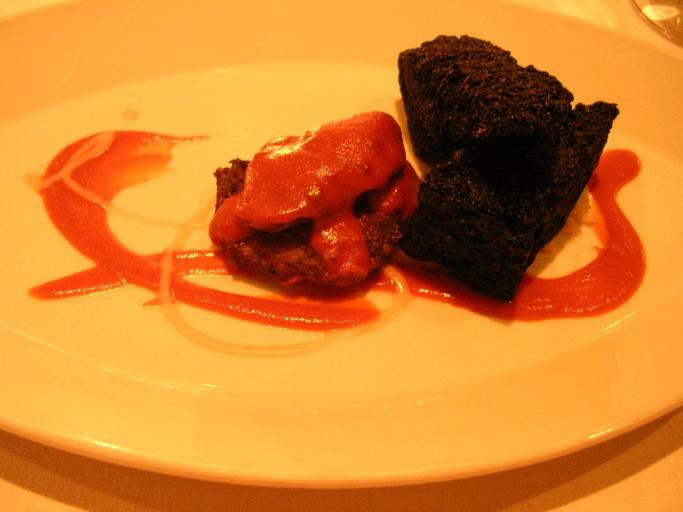 The briquettes, which had a nice toasty texture, seemed to add grill flavor even though I knew it was squid ink. My mouth and my eyes disagreed about what was going on, but my mouth won. Course 12: "Quail & white truffle"
Despite the name, this was actually a take on macaroni and cheese. The small, warm glass had a piece of quail meat at the bottom, some cooked and dehydrated macaroni, smoked cheddar purée, powdered truffle oil, and chives. The macaroni were unexpectedly crispy (but not rock-hard like uncooked macaroni). They played against the smooth, rich quail, the richness of the cheese, some mysterious spicy heat, and the fumes of the truffle oil brought out by the warmth of the glass. It was some of the biggest-flavored "comfort food" I've ever had. Damn fine. Course 13: "Steak & eggs"
Deconstructed steak and eggs. 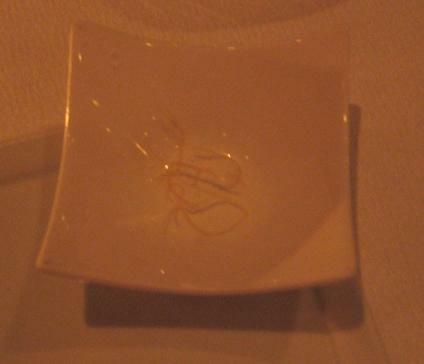 The cube on the left was steamed egg white. The egg yolk had been softly cooked, mixed with puréed spinach, piped back into a hole in the middle, and topped with micro-arugula. The slices in the middle were tender prime rib with a "smear" of shallot and mustard purée. On the right was a "moto hash brown" in a puddle of heirloom tomato purée. I'm not much of a steak person myself, much less steak-and-eggs, so this didn't do a whole lot for me. The tomato purée tasted nothing like ketchup, but was an intriguing alternative. Josh contemplates his steak and eggs. A bunch of different things going on here. Starting from the left, there's a white rice "chip" with blackcurrant and butternut squash flavoring powder, a cinnamon-infused apple slice and a vanilla-infused asian pear slice underneath, chopped bits of black walnut, a cube of carbonated watermelon, and a mixture of triple-creme cheese and white chocolate. I was really skeptical of the cheese and chocolate mixture, but there was a surprisingly good balance between the two flavors, and it served as a nice dip for the apple and the pear. The apple and pear tasted surprisingly natural — again, a nice flavor balance. And I don't know how CO2 was used in most of the preparations, but it was obvious with the watermelon cube: it had a wonderful, really potent fizz. Apparently they just cut up cubes of watermelon and pumped carbon dioxide into them, like how a water carbonation machine works. Jesse mentioned that he was installing a home carbonation machine, and said he'd definitely have to try carbonating some watermelon. This was one of his favorite dishes. Our waiter had told us earlier in the meal that he was actually a cook too. Many of the waitstaff at moto are first and foremost cooks, who are assigned to do regular rotations working the front of the house. As a result, he was able to tell us a lot about the dishes, and he pointed out that the flavored rice chip in this course was one of his inventions. He was also more excited about presenting the dishes than most waiters I've seen; I think his approach would be out of place in some restaurants, but it seems like a very natural thing when you put cooks out front. It reminds me of what happens in my line of work (software development) when you send an engineer, rather than a salesman, to talk with a customer. It can be great for both people, but you have to be ready for it. I did ask him why he thought Chicago was a hot spot for molecular gastronomy, and he agreed that Charlie Trotter probably had a lot to do with it. So that's one hunch confirmed. 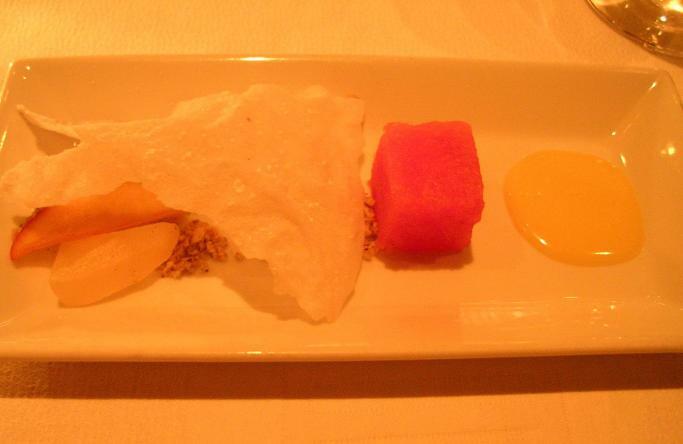 Course 15: "3 cotton candy stages"
Three unexpected forms of cotton candy. The "paper" was completely edible, made using super-secret technology of course, and tasted vaguely but unmistakably like cotton candy. 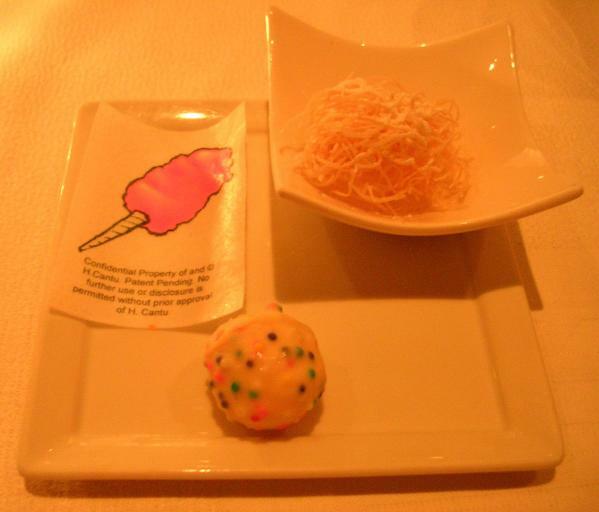 The ball was made of white chocolate and nonpareils, and had a cold thin liquid center that tasted of cotton candy. It was interesting, but the flavor of the liquid only lasted a second or so, and was quickly replaced by the flavor of white chocolate. (The nonpareils added an unexpected texture contrast.) The "tangle" was described as "fried cotton candy and cotton candy powder." I sure can't imagine frying any cotton candy I've ever seen, but whatever they did, it was a hit. It was an instant State Fair flashback — pure cotton candy flavor and a side of deep-fried deep fry. Course 16: "Flapjacks prepared tableside"
then picked each one up with a spatula and placed it quickly into a waiting spoon. 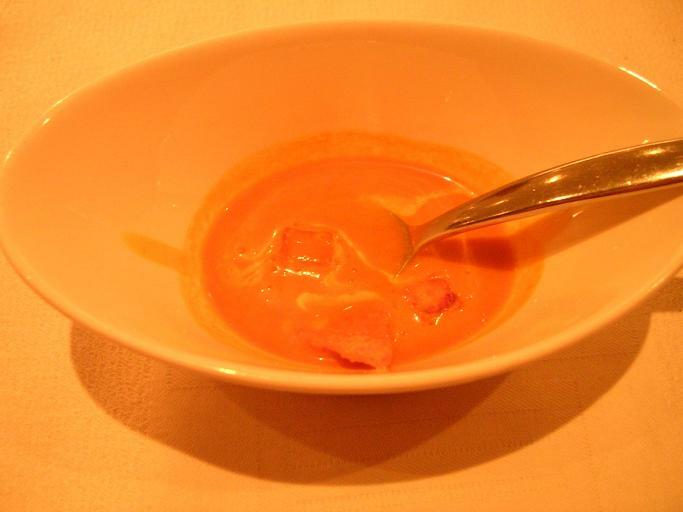 The spoons had been prepared with a small puddle of rich maple syrup in each one. Another interesting illustration of what liquid nitrogen can do — the crème anglaise definitely had the texture of a (really cold) cooked pancake! This seemed like a direct copy of the Morphings that I had at elBulli, but adapted to play up the breakfast food aspect of the experience. Lots of fun. Freshly made carrot cake, served in several different forms: soup (! 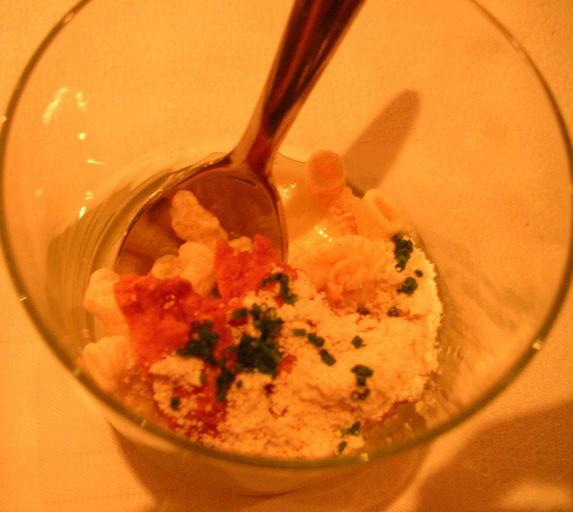 ), a tuile, croutons, and cream. All four forms were not just carroty, but carrot-cakey. Since the croutons were made from carrot cake, they were very dense and chewy. By about this point in the meal, there was no question that we were getting full. 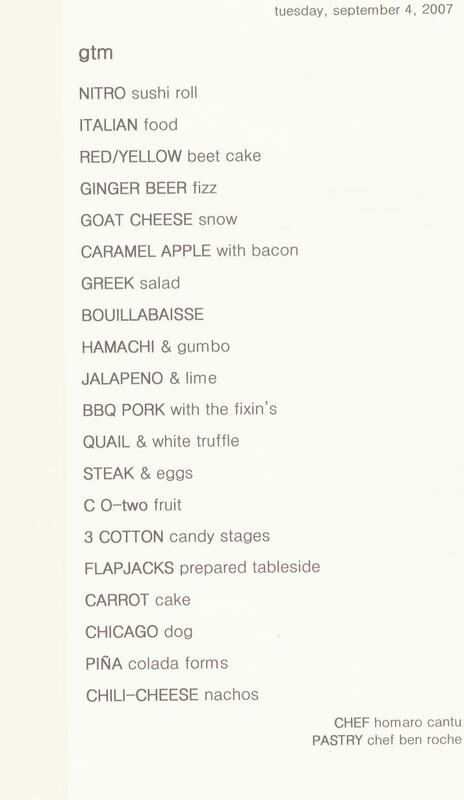 Jesse had been looking at the "Chicago dog" lurking at the end of the menu with a bit of indigestion; yes, things are different at moto, and maybe it makes sense to have a big hunk of hot dog and fixin's at the end of a meal, but it sure sounds like a gut bomb. Of course, we had nothing to fear. The hot dog that we were served was about as long as my thumb, and was strictly dessert: a muffiny brown-butter bun, a "hot dog" of strawberry sorbet, a "tomato slice" of raspberry gelee, cubes of "relish" made from green tomato gelee, asian pear "horseradish," and lemon curd "mustard." 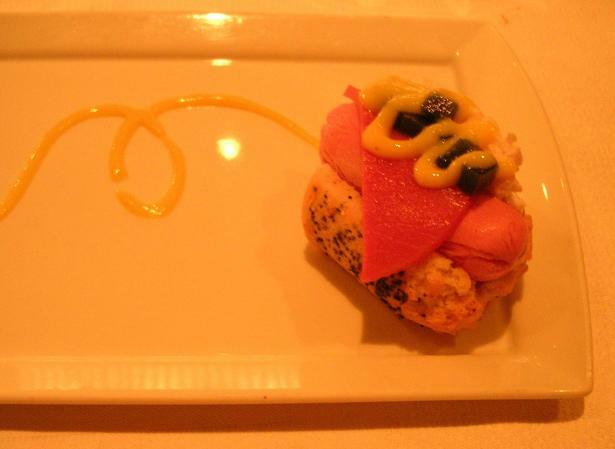 The strawberry sorbet had a strikingly realistic "hot dog end" pattern on each side, adding to the realism. The fruity flavors and the chill of the sorbet were nicely refreshing, while the experience of looking at what seemed to be a bit of aggressive street food and tasting refined fruitiness kept us off guard. 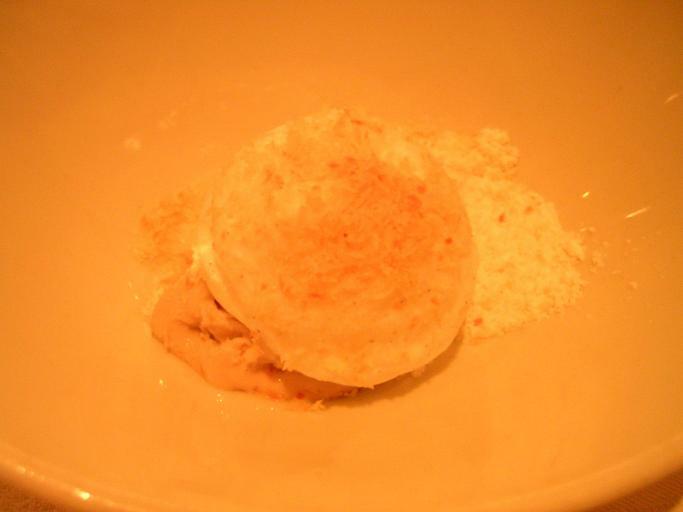 Course 19: "Pina colada forms"
Rum ice cream, coconut foam, toasted coconut, and pineapple powder. Pleasant, but the ice cream wasn't as rummy as I might have liked. We'd been looking at this one with as much trepidation as the "Chicago dog," and again, we had nothing to worry about. 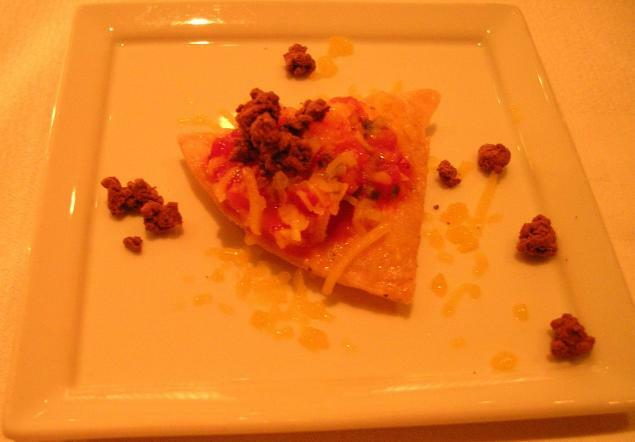 The "nacho" was a bit of sweetened corn tortilla; it was topped with chocolate "ground beef," "Pace picante sauce" of strawberries, and mango "cheese." Another good round of laughs for this one. The chocolate was strong and tasty, which normally I don't mind at all, but here it took away a bit from the rest of the dish, which was cool and light and refreshing. 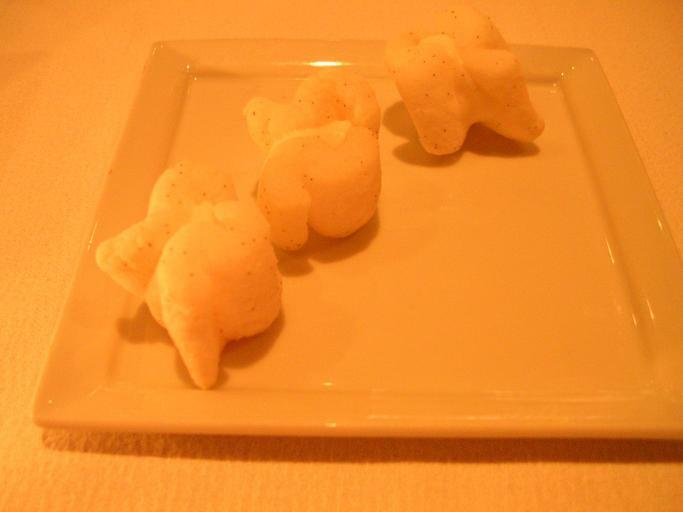 These were a lot like the biodegradable packing peanuts, but made with vanilla crème anglaise and vanilla sugar. I've never eaten one of the real peanuts, but I suspect this one was better than most. Quite a meal. We went back to the hotel full and beaming. We played tourist for a couple days, seeing the city by foot and by El, and sweating off the remains of our big meal in the hot and humid Chicago summer. 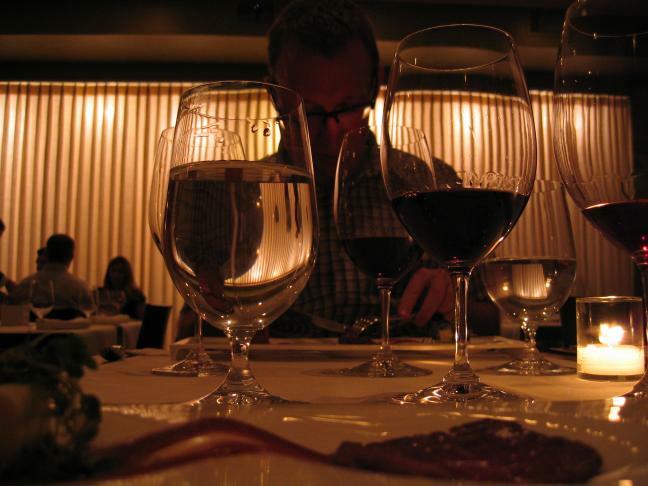 By Thursday evening we had walked enough, and were ready and excited for our trip to Alinea.